In 1907, three years before the move from the Union Library to the new Carnegie building, Davidson hired the college’s first full-time librarian, Cornelia Shaw. Shaw served as both librarian and registrar from 1907 until 1921, then remained exclusively as librarian until her retirement in 1936. 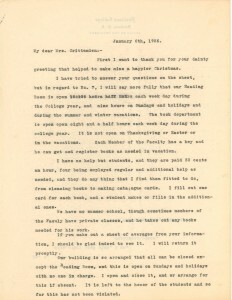 Shaw acted as library hostess, being sure to create as “home-like and comfortable” an environment as she could, while also insisting that students follow a code of conduct (“Letter to Miss Petty” February 1915). For example, the young men were expected to wear blazers and adhere to the guidelines posted throughout the building. 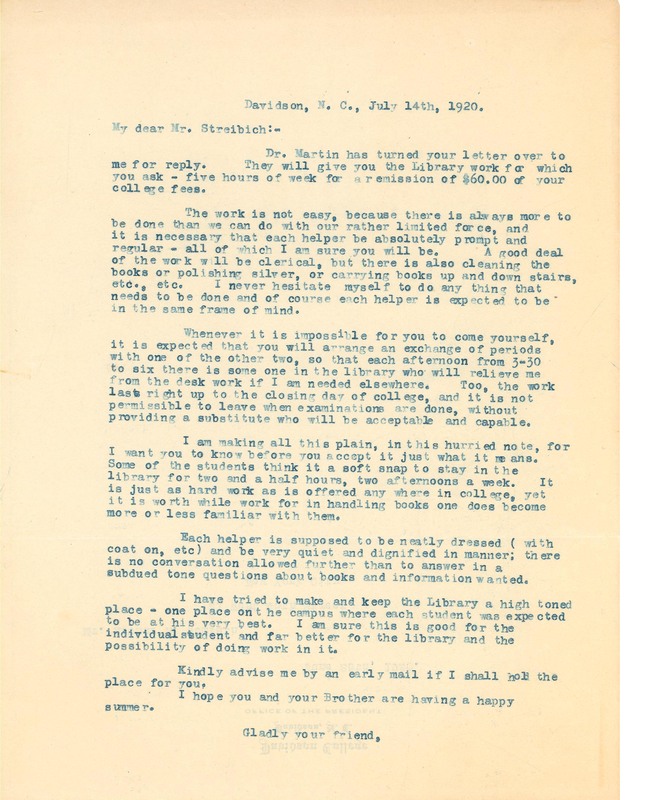 Shaw constantly corresponded with members of the college community on the topics of library upkeep, the locating of documents, and collecting information for historical records. She hired and supervised library janitors and kept extensive records on all decorations purchased for holidays and school events. 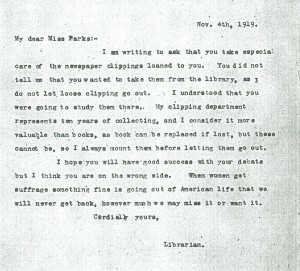 In a letter to a Miss Parks, Shaw revealed with pride that she collected newspaper clippings for ten or more years, considering them “more valuable than books, for a book can be replaced if lost” (“Letter to Miss Parks” Nov. 1919). 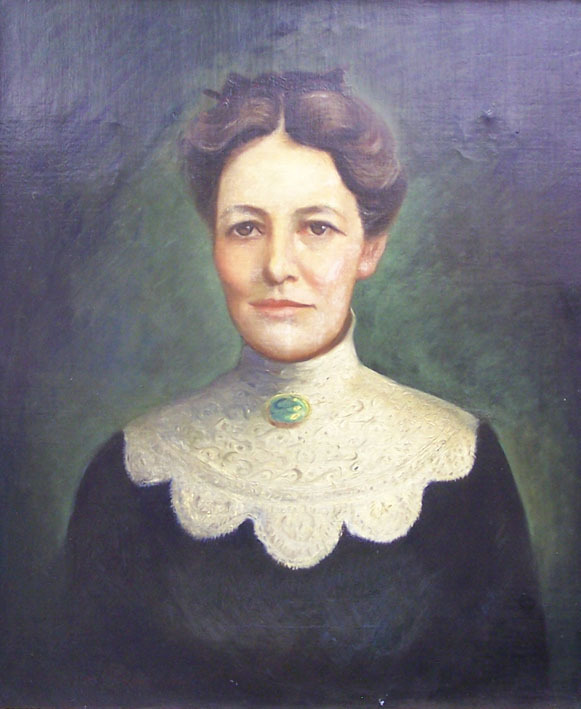 She also carefully collected portraits of presidents and board members, in an effort to preserve the history of a school for which she cared passionately. 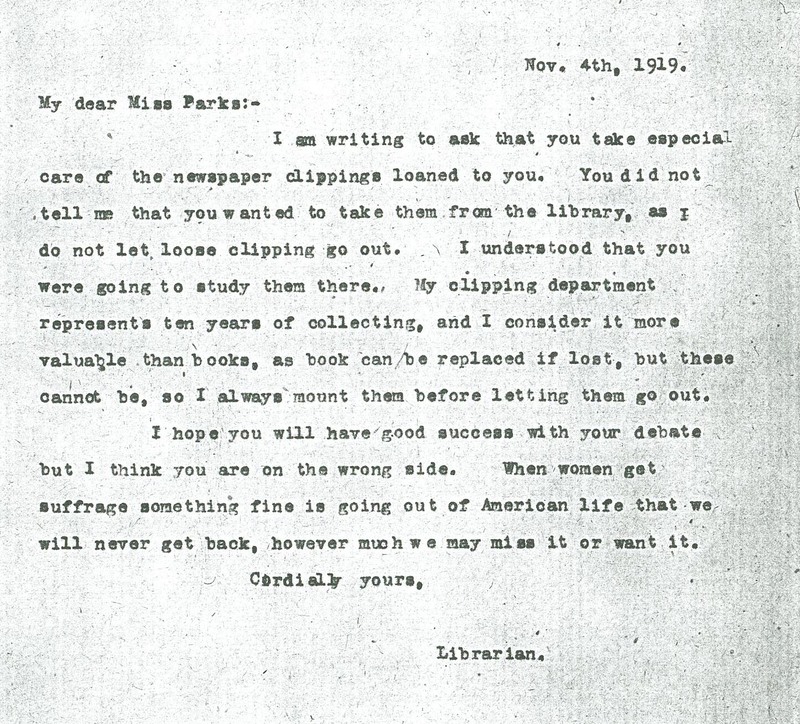 Above all, however, Shaw delighted in working with students, saying that “the joy to me in library work is the daily, almost momently touch with young and interested life” (“Letter to Miss Parks” 1919). She carried on correspondence with students who were sick, lost items in the library, or left Davidson altogether, and seemed to truly care about Davidson as a community and about each young man in attendance. In fact, Shaw wrote to a former student: “the new men who come, make their own place. They do not take the place of the men who drop out and I feel always that Davidson is the loser in losing any one of our students” (“Letter to W.M. Smith” Nov. 17, 1916). 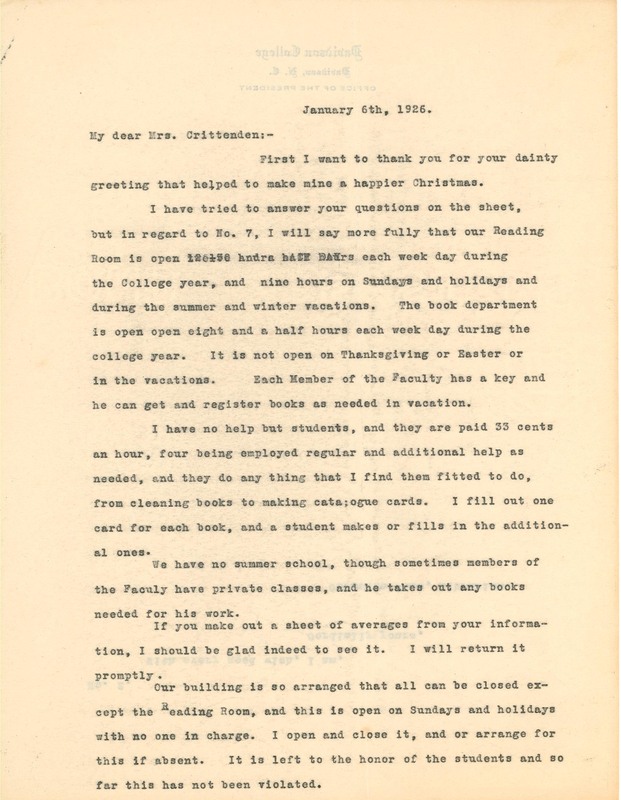 Shaw interacted with students as both library patrons and as employees; her student assistants performed clerical work, cleaned books, polished silver, and helped “Miss Librarian” keep her domain in the best shape possible. Under Shaw’s leadership, the Carnegie Library was a center of rich community values and a welcoming, comfortable place. In correspondence with a friend, Shaw wrote, “personally, I feel as if the building is my home and the men coming in are guests. 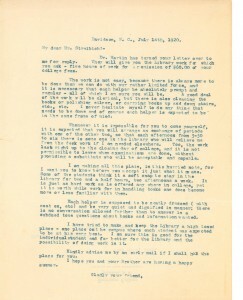 How they feel about it, I do not know, but they act the part beautifully” (“Letter to Miss Petty” February 1915). Shaw cared deeply for the students and community of the college and reflected this throughout her time at the school. Photograph of Cornelia Shaw. Quips and Cranks Vol. 15. Davidson: Davidson College, 1912. Correspondence, 1917-1918. Davidson College Archives, Davidson, NC. —. Letter to Miss Parks. 4 November 1919. RG 3/4.1b. Library Correspondence, Shaw, Cornelia, 1919-1920. Davidson College Archives, Davidson, NC. —. Letter to Miss Petty. 1 February 1915. RG 3/4.1b. Library-Shaw, Cornelia, Correspondence, 1909-1916. —. Letter to Mr. Streibich. 14 July 1920. RG ¾.1b. Library- Shaw, Cornelia, Correspondence, 1909-1916. 1916. Davidson College Archives, Davidson, NC.